Enjoy the fun and excitement of singing in a community chorale! 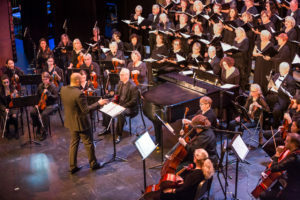 The Sno-King Community Chorale is a non-audition choir. We rehearse and perform a wide variety of music from Brahms to the Blues with passion and camaraderie. Enthusiasm is required. Spring rehearsal begins April 2, 2019 at Edmonds Community College in Mill Creek Hall, room 109 on the college’s main campus. Feel free to stop in and sit in on a rehearsal. Rehearsals are held on Tuesday evenings from 7:00 to 9:30 pm at Edmonds Community College in Mill Creek Hall, room 109 on the college’s main campus. Attendance at rehearsals and performances is mandatory. Special rehearsals and dress-rehearsals are also held as needed. The tuition is $120 per quarter, with discounts for multiple members from the same household. Concert attire will also need to be purchased. The “Ed Aliverti Scholarship” is available on a limited basis to member of the Chorale who request one because of financial hardship. To apply for a scholarship, please fill out the following form – Ed Aliverti Scholarship Application. If you have any questions regarding registration, send us an e-mail at Registrar@Sno-KingChorale.org. Download the Registration form below, complete it, sign it, and turn it in to the Registrar. Be sure to sign and date the form. This action ensures timely receipt of your music. Register by Mail: Mail the signed and dated SKCC Registration Form to: P.O. Box 382, Edmonds, WA 98020-0382. Include a check made out to: Sno-King Community Chorale (SKCC). Register in Person: Registration will be accepted during the two week enrollment period at the start of each quarter at rehearsal. You may pay by check, cash, or a credit card (3% fee applies for credit cards). Share my information with SKCC members only.Share only my name and phone number with SKCC members.Do not share any of my information with SKCC members.